Gillian Tett: Female Trump supporters feel they have numerous other reasons to back him, ones that are more important than gender. To an angry, dispossessed voter, Trump offers a vision of change that Clinton does not; to them, his anti-establishment speeches and “Make America Great Again” mantra are positive and memorable in a way that none of the slogans from the Clinton camp has managed to be. As Michelle Obama pointed out in her own thrillingly powerful speech in Philadelphia on Monday — to many voters today it no longer seems odd that a woman is running for president. That is an extraordinary achievement. But it could also be a tragedy for Clinton; it means that the Democrats cannot assume they can win female votes “just” by using the gender card. In 2014, she was named Columnist of the Year in the British Press Awards and was the first recipient of the Royal Anthropological Institute Marsh Award. In June 2009 her book Fool’s Gold won Financial Book of the Year at the inaugural Spear’s Book Awards. IMF’s top staff misled their own board, made a series of calamitous misjudgments in Greece, became euphoric cheerleaders for the euro project, ignored warning signs of impending crisis, and collectively failed to grasp an elemental concept of currency theory. The Federal Reserve is being forced to reevaluate its most basic assumptions about the economy after trillions of dollars of stimulus and years of ultralow interest rates have failed to generate a more robust recovery. “I think all of us are involved in a process of constantly re-evaluating where is that neutral rate going,” Yellen told reporters last month. Among the most prominent theories is one championed by former Treasury secretary and Harvard economist Lawrence H. Summers, which argues that deeper forces are discouraging business investment and miring the economy in an era of so-called "secular stagnation." There is by now near universal agreement that reliance on zero rates and quantitative easing merely to drive up asset prices have reached their limits, rewarding the owners of capital with precious little trickle-down to the working poor. Simon Ward from Henderson Global Investors says his key measure - six-month real M1 money - is rising at a rate of 10.5pc, the fastest since the post-Lehman stimulus. Critics from Britain rightly argue that the monetary union is failing because of a divergence of economic performance. There are now backstops in place but they will not stop member states drifting further apart. The solution is at the very least a central authority in charge of banking and finance, a small budget and some joint debt instruments. If politics does not allow this, you have to accept the adage that if something is not sustainable it will come to an end. Mr Trump has caught the policy mood, not just in America but also across the western world. For the Cleveland convention is certainly not the only place where fiscal austerity is going out of fashion. In late 2008 Queen Elizabeth II famously asked why no one had seen the downturn coming. In late 2008, during a briefing at the London School of Economics, Queen Elizabeth II famously asked why no one had seen the downturn coming. For economists employed in the financial sector, there is an implicit bias towards optimism. As one once told me "There is no incentive to forecast a recession, If you are wrong, you'll be fired. And if you're right, no one will thank you." Wolf: The remedies they /Trump Le Pen/ offer are bogus. But the illnesses are real. If governing elites continue to fail to offer convincing cures, they might soon be swept away and, with them, the effort to marry democratic self-government with an open and co-operative world order. The Economist: Deutsche Bank trades at about a quarter of the notional value of its net assets. If it were a non-financial firm it would be broken up. But big banks cannot be dismantled without risking chaos. As well as disrupting the market, bidding ever higher prices for bonds renders more costly the ultimate, paradoxical denouement of the policy, when inflation finally arrives, causing yields to rise and bond prices to crash. Really credible stimulus should avoid this. Bank of Japan governor from 1911 to 1913.
and will seek a return to Glass-Steagall, the banking law launched in 1933 in the aftermath of the Great Depression meant to prohibit commercial banks from engaging in the investment business, and which according to many was one of the catalysts that led to the Global Financial Crisis. Hon lät lika övertygande som socialdemokrat som hon efter 1998 gjorde som folkpartist. Själv skulle jag, ärligt talat, inte ens köpa en begagnad bil av Marit Paulsen. Hennes övertygande röst till trots. Detta var, sa hon, hennes sista offentliga framträdande. Tja, vi får väl se, tänker jag. Omprövningens tid! Det är med stor osäkerhet jag försöker beskriva ett slags förvirring, rent av en smula hjälplöshet inför det som händer i Östeuropa. Vart tog alla drömmar vägen? Vart är alla de ORD jag har använt? Var är de begrepp jag tänkt i? Säg inte - don’t say - don’t say - att vi rest till det demokratiska Sverige och kommit till en kommunistfamilj? · Nä ,nä - inte så heller. - Euron har för länge sedan bevisat sin styrka. We shouldn’t have to talk about central banks and their leaders every time we discuss the economy. Monetary policy is but one factor in the grand economic equation and should certainly not be the most important one. Yet the Fed and its fellow central banks have been hogging center stage for nearly a decade now. That might be okay if their policies made sense, but abundant evidence says they do not. Overreliance on low interest rates to stimulate growth led our central bankers to zero interest rates. I cannot state this strongly enough: Italy is dramatically important, and it is on the brink of a radical break with European Union policy that will cascade into countries all over Europe and see them going their own way with regard to their banking systems. Det ser ut som om det har lyckats. Men i dag är räntan redan runt noll och vad händer när den nya bubblan spricker? Anders Borg: In fact, federalism is probably the single greatest threat to the future of the EU. Welcome in the club. European Commission President Jean-Claude Juncker has called for more federalism – for more power to be delegated to the EU’s governing institutions.I consider Juncker a close friend, but I strongly disagree with him about this idea. Moving toward deeper integration or centralized control would be a dangerous path to take, for it would increase the risk of other members choosing to leave the EU. And, beyond that hazard, there are other reasons to avoid federalist measures. Consider the main economic argument offered by federalists: the eurozone needs a common fiscal policy to harmonize policy decisions, such as taxation. This is wrong for two reasons. First, the EU’s fundamental economic problems are structural. Europeans will continue to gravitate toward populism if they do not see improvements in their standard of living, which will happen only with higher productivity growth. A single fiscal policy would not bring this about – and could make the problem worse. Today, supporters of the EU must face the facts: an ever-closer union is not the European people’s will, even in the member states that would never choose to leave it. If the European Commission forces the post-Brexit narrative in this direction, the result will be the opposite of what was intended. In fact, federalism is probably the single greatest threat to the future of the EU. - Problemets kärna är att det inte går att ha EMU om man inte vill ha ett Federalt Europa, styrt från Bryssel och Frankfurt, eller om det blir Berlin. - Det är målsättningen om ett ständigt fastare förbund - "ever closer union" - som är själva grundbultsfelet med EU. Problemet, för Anders Borg, är att det sedan länge har rått consensus inom ekonomkåren, en ovanlig sak, om att det behövs avsevärt med federalism för att euron inte skall gå under. Det vet Anders Borg och jag är säker på att han kommer att stå upp för den åsikten, när den ryms inom åsiktskorridoren. A move by Italy — the third-largest economy in the eurozone — to abandon the euro could strike a potentially fatal blow to the currency and to the bloc itself. 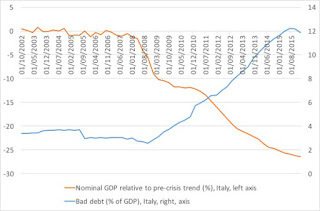 Meanwhile, at more than 130% of GDP, Italy has one of the biggest public debt burdens in Europe, second only to Greece. 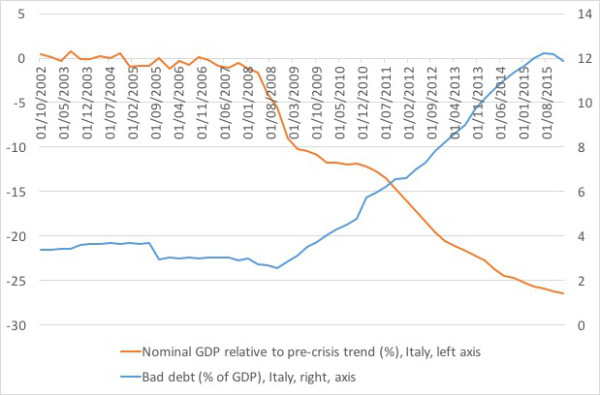 "A perfect storm of slow or zero Italian economic growth, low interest rates and politically connected, often corrupt, lending have combined to create a situation where the Italian financial system is in need of a large rescue." — Mihir Kapadia, Sun Global Investments. M5S blames the euro for Italy's woes, and many Italians agree. The eurosceptic Five Star Movement (M5S) has overtaken Prime Minister Matteo Renzi's Democratic Party (PD) in several opinion polls and is now the most popular political party in Italy. but even the most conservative banks will get into trouble when nominal GDP drops 25% below the pre-crisis trend. Shares of the 147-year-old company now trade for a paltry 8% of its peak price in May 2007. Bill White is a former BIS chief economist and now chairs the OECD Economic Development and Review Committee. He famously pushed Alan Greenspan to raise interest rates in 2003 so the Fed would have a cushion to use in the next crisis – which Bill thought would come along in a few years. Sure enough, he was right. Bill told us last year that the world’s central banks were making a mistake with their single-minded focus on monetary policy. He noted, correctly, that monetary solutions have not helped, and he stated emphatically that more of the same won’t help, either. Interest rates have an important signaling function. What happens when the signals are wrong? People make bad decisions, of course. And, for at least the last six years (perhaps more), the signals have been very wrong indeed. An unsustainable level of private sector debt is the main factor explaining the present severe downturn, as well as many previous downturns in history. David Folkerts-Landau, chief economist at Deutsche Bank, says “Europe is Seriously Ill”, and EU banks need a €150 billion bailout program. He suggests a huge EU bailout program. Private creditors should not participate. The EU rules are “very clear” on when creditors should face compulsory losses, known as bail-ins, Mr Dijsselbloem said. “The only thing that to me is very important is that we respect what we have agreed between us, because otherwise everything will be questioned in Europe” he said. Germany’s surplus on the current account of its balance of payments surged to a record level last year, reaching $285bn, or 8.5 per cent of gross domestic product. It is now overtaking the Chinese surplus as the largest trade imbalance in the world. - Minnet av andra världskrigets förstörelse har passerat in i historieböckerna och tankar som t ex att EU först och främst är ett fredsbevarande projekt möter idag främst höjda, förvånade ögonbryn från nya generationer. Han och de andra EU-kramarna vill få oss att tro att det var EU, tidigare EG och ännu tidigare EEC, som skapade freden i Europa. Men det var nog tvärtom. Det rådde fred och samförstånd i Västeuropa under 50- och 60-talen. Det gav möjlighet att skapa dessa institutioner. Det gäller att kunna skilja på orsak och verkan. Mer om EU och freden här. In his latest just released monthly letter, Bill Gross lays out the global economy as an analogy to Monopoly where the narrative only works if everyone gets $200 in cash on every rotation around the board. It’s the $200 of cash (which in the economic scheme of things represents new “credit”) that is responsible for the ongoing health of our finance-based economy. Without new credit, economic growth moves in reverse and individual player “bankruptcies” become more probable. the fashionable cross-breed of psychology and economics. Martin Wolf: The question is whether the best way to preserve the EU is to make it a prison, rather than a desirable place of refuge. 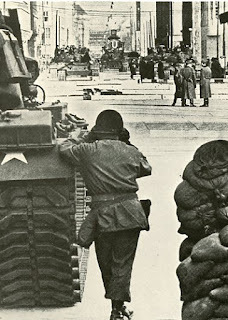 Yugoslavia 1991: How Can a War Start If Nobody Wants It? Reinfeldt leder ett parti och en regering som vill ansluta Sverige till Euroland. Därför kan han, lika lite som andra EMU-kramare, inte erkänna att det är något fel på tanken på att bunta ihop, slå samman, länder som Tyskland och Grekland, Irland, Spanien och Sverige i något som liknar ett Gross-Jugoslavien. Jag är övertygad om att det ekonomiska system som byggt upp i Jugoslavien i form av arbetarstyrda företag tillhör en av vårt århundrades mest betydelsefulla sociala innovationer. "Men EU är i alla fall bra för Freden"